Etymology: Celastrus comes from the ancient Greek word kelastros, a name for an evergreen tree. Orbiculatus means disc-shaped or round (1, 7). ¬ Yellow to orange fruits, often dehiscent to expose bright red to orange arils covering seeds. Plant Height: Mature plants climb to 18m tall and reach 13cm dbh (1). 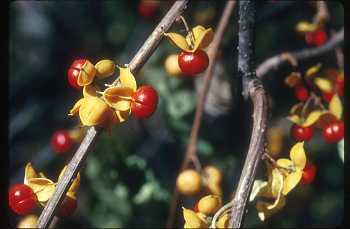 Most Likely Confused with: American bittersweet Celastrus scandens, a native to Michigan. The genus is the only vining genus in Michigan with simple alternate crenate leaves. Habitat Preference: Open woods and thickets, roadsides, fence-rows. However it is shade-tolerant and can grow under a forest canopy (3, 6, 16). 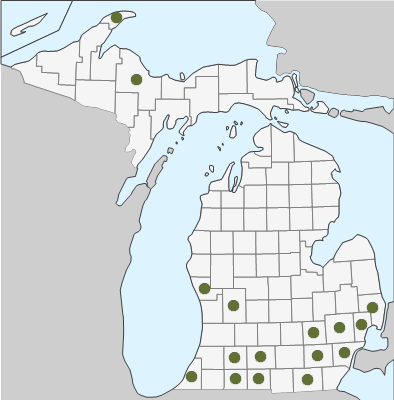 Geographic Distribution in Michigan: The USDA reports it as present in only three counties in southern Michigan: Berrien, St. Joseph, and Washtenaw (6). 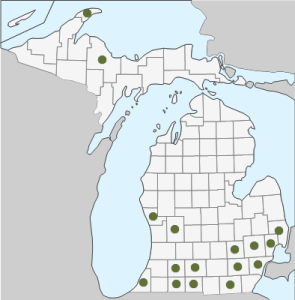 However the Michigan Flora Online data base lists it in 11 counties and we anticipate this will increase over time (18). Known Elevational Distribution: 450-2200m (10). Complete Geographic Distribution: Native to Japan, Korea, and northeastern China. Invasive in North America, covering the northeastern states. Extends north to Quebec, south to Georgia, and west to Iowa and Arkansas (2). Vegetative Plant Description: Deciduous, perennial, woody vine with leaves variable in shape, ranging from ovate to obovate to suborbicular, 5-13 × 3-9 cm in size. Leaf margins are serrate, bases are obtuse to rounded, apices acute to rounded. Serrations are often rounded. Midvein is prominent with 3 to 4 pairs of ascending secondaries per side. Petioles are light green and 1-3 cm long (1, 8, 9, 17, 19). Twigs are brown with pale lenticels, larger stems are pale grey-brown with elliptically shaped lenticel patches (see image). 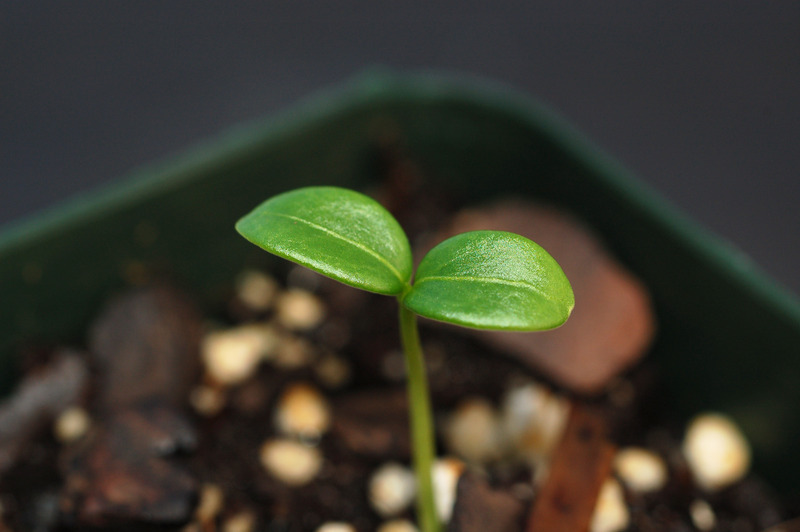 Seedlings have fleshy, ovate, entire cotyledons (pers. obs.). Climbing Mechanism: Plants climb by apical stem twining; no tendrils or adventitious roots. Plant stems twine dextrally (left to right). Flower Description: Flowers are white or yellow to green and inconspicuous, borne in axillary cymes (1-3cm) of 1-7 small flowers, but male plants sometimes grow in terminal inflorescences (19). Plants can be monoecious or dioecious. Flowers are functionally unisexual and 5-merous. Staminate flowers with petals 3-4 × 2-2.5 mm, 5 stamens 2-3 mm (or slightly longer) inserted on the margin of a cup-shaped disk, and a vestigial pistil. Pistillate flowers bear petals slightly shorter than in male flowers, and have vestigial stamens and a well-developed superior ovary. The style is stout and columnar, 1.5cm long; the stigma is 3-lobed. There are two ovules per locule (1, 8, 9, 19). Flowering Time: Mid to late spring (May and June), in Ohio (9). Pollinator: The flowers are bee and wind pollinated (1). Fruit Type and Description: The fruit is a yellow or orangish-yellow globose capsule, 0.8-1.3cm. When ripe, the capsule splits open to reveal an orange to red fleshy aril covering seeds. Capsules have three valves; each valve contains one or two seeds (8,19). Seed Description: Seeds are ellipsoid and yellow to light-orange, covered in a fleshy scarlet aril (personal observation, Susu Yuan, Oct 26, 2006). Reported to have best germination in low light (13). Dispersal Syndrome: Seeds are bird dispersed (16). Fruits are toxic to humans. However, human dispersal is also prominent as the showy inflorescences are often used in the florist trade. Plants also reproduce by rhizomes. Root collar sprouting also occurs (1). Distinguished by: When distinguishing between C. scandens and C. orbiculaus, floral or reproductive characters are the most reliable. Inflorescences of C. orbiculatus are axillary cymes; those of C. scandens are terminal panicles. When fruiting, the valves of C. scandens are orange, whereas the valves of C. orbiculatus are generally yellow. Due to the variability of leaf size and shape of C. orbiculatus, leaf morphology is not a reliable character according to Voss (6). However, a recent study (15) suggests differences in leaf morphology are sufficient for plant identification. The most reliable of these is leaf ptyxis (leaf folding in bud): C. orbiculatus has a conduplicate folding, while that of C. scandens is involute (margins inrolled). The study also suggests that if the length-to-width ratio of the leaf “is greater than or equal to 2, there is a 90% chance of the plant being [C. scandens], while if the ratio is less than or equal to 1.4, there is a 90% chance of it being [C. orbiculatus]….Plants with leaf tips of 1.5 cm or longer have a 90% chance of being [C. scandens], while plants with leaf tips of 0.3 cm or less have a 90% chance of being [C. orbiculatus]” (15). Ethnobotanical Uses: Attractive fruits makes this a popular species for ornamental plantings or cuttings (10). Phylogenetic Information: Families Celastraceae and Lepidobotryaceae both are members of the order Celastrales. Celastrales belong in the Eurosids I. They form a monophyletic group with the Malpighiales and Oxidales. They are part of the rosids inside the eudicots. Celastrales are angiosperms (4). Bittersweet is a “functionally dioecious” species because on a single plant either the male or female flowers will abort. Some plants can produce both unisexual and bisexual flowers however, making the breeding system quite complicated (20). Bittersweet can kill host trees by girdling if allowed to reach sufficient sizes (11). Recent experimental evidence suggests that Celastrus orbiculatus tolerates herbivory better than the native bittersweet, which may contribute to its ability to invade (14). Oriental bittersweet is yet another invasive plant introduced from Asia as an ornamental plant, this one introduced about 1860 (16). Ellsworth, J.W., R.A. Harrington, & J.H. Fownes. 2004. Survival, growth and gas exchange of Celastrus orbiculatus seedlings in sun and shade. The American Midland Naturalist. 151(2): 233-141. Dreyer, G.L., L. Baird, & C. Fickler. 1987. 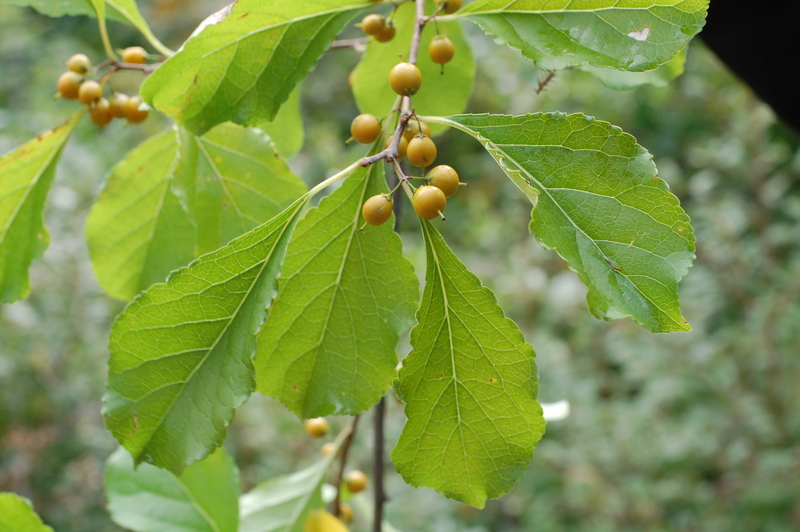 Celastrus scandens and Celastrus orbiculatus: Comparisons of reproductive potential between a native and an introduced woody vine. Bulletin of the Torrey Botanical Club 114(3): 260-64. Voss, E.G. 1985. Michigan Flora Part II. Ann Arbor: University of Michigan Press. Gleason, H.A. & A. Cronquist. 1991. Manual of Vascular Plants of Northeastern United States and Adjacent Canada. New York: The New York Botanical Garden. Cooperrider, T.S. 1995. The Dicotyledons of Ohio – Part 2. Linaceae through Campanulaceae. Columbus: Ohio State University Press. Hou, D. 1955. A revision of the genus Celastrus. Annals of the Missouri Botanical Garden 42:215-302. Robertson, D.J., M.C. Robertson, & T. Tague 1994. Colonization dynamics of four exotic plants in a northern Piedmont natural area. Bulletin of the Torrey Botanical Club 121(2):107-118. Ashton, I.W. & M.T. Lerdau 2008. Tolerance to herbivory, and not resistance, may explain differential success of invasive, naturalized, and native North American temperate vines. Biodiversity and Distributions 14:169-178. Pavlovic, N.B., S.L. Young, R. Grundel, & K.J. Frohnapple. 2007. 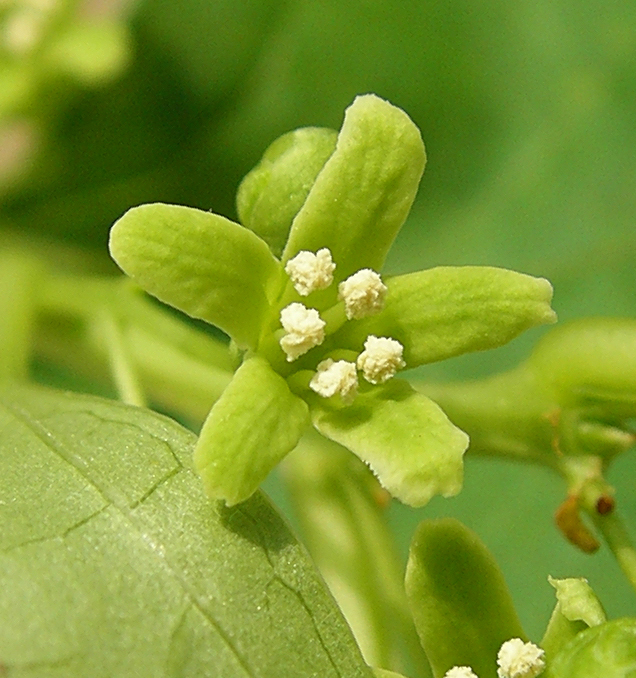 Distinguishing native (Celastrus scandens L.) and invasive (C. orbiculatus Thunb.) bittersweet species using morphological characteristics. Journal of the Torrey Botanical Society 134(4): 441-450. Greenberg, C.H., L.M. Smith, & D.J. Levey 2001. Fruit fate, seed germination and growth of an invasive vine – an experimental test of ‘sit and wait’ strategy. Biological Invasions 3: 363-372. MICHIGAN FLORA ONLINE. A. A. Reznicek, E. G. Voss, & B. S. Walters. February 2011. University of Michigan. 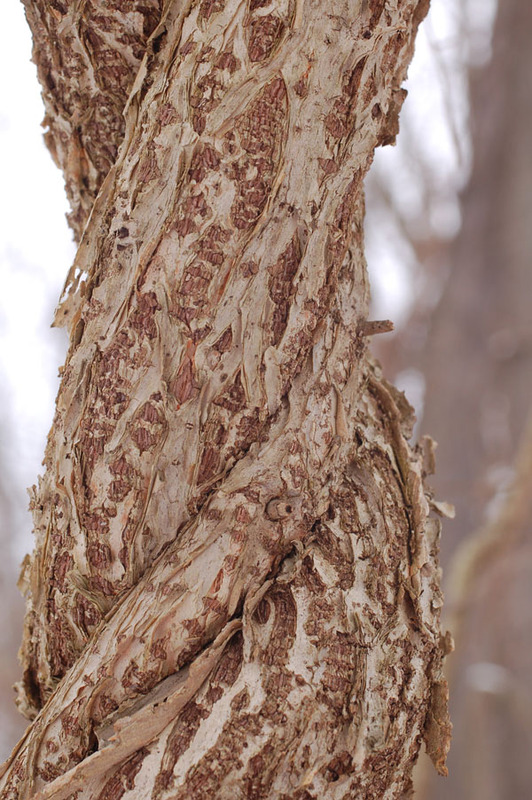 November 15, 2012. http://michiganflora.net/species.aspx?id=801. This entry was posted in Celastraceae on May 29, 2013 by robyn.